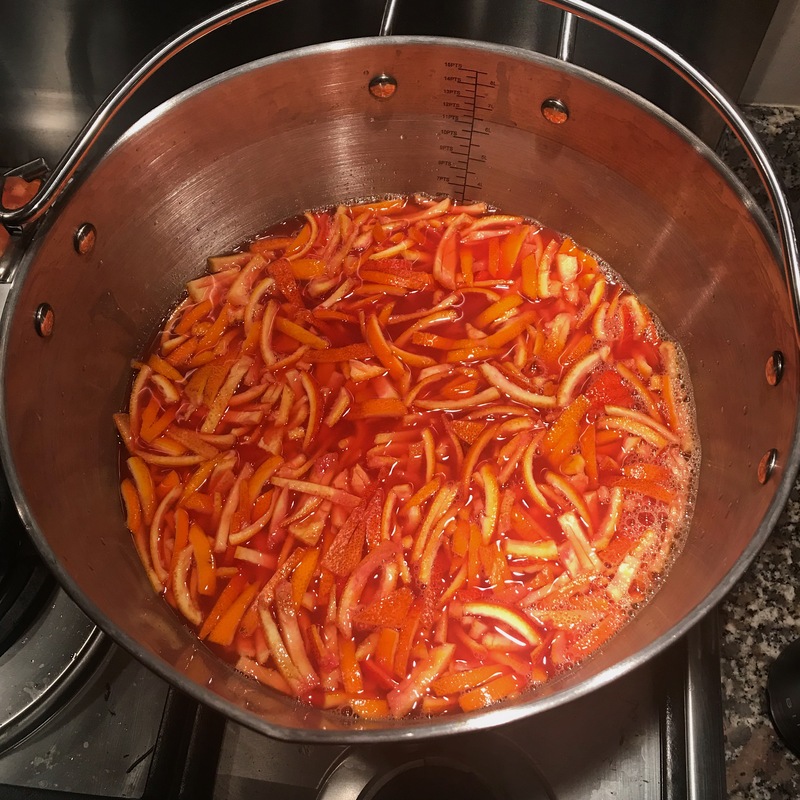 Marmalade – at its simplest just three ingredients- oranges, sugar, water. I have always been a fan of eating the citrusy tangy orange jam, like Paddington Bear, but never made it myself. As a food blogger I would like to think I know my way around a kitchen & a jam jar, having made jams and chutneys many times. 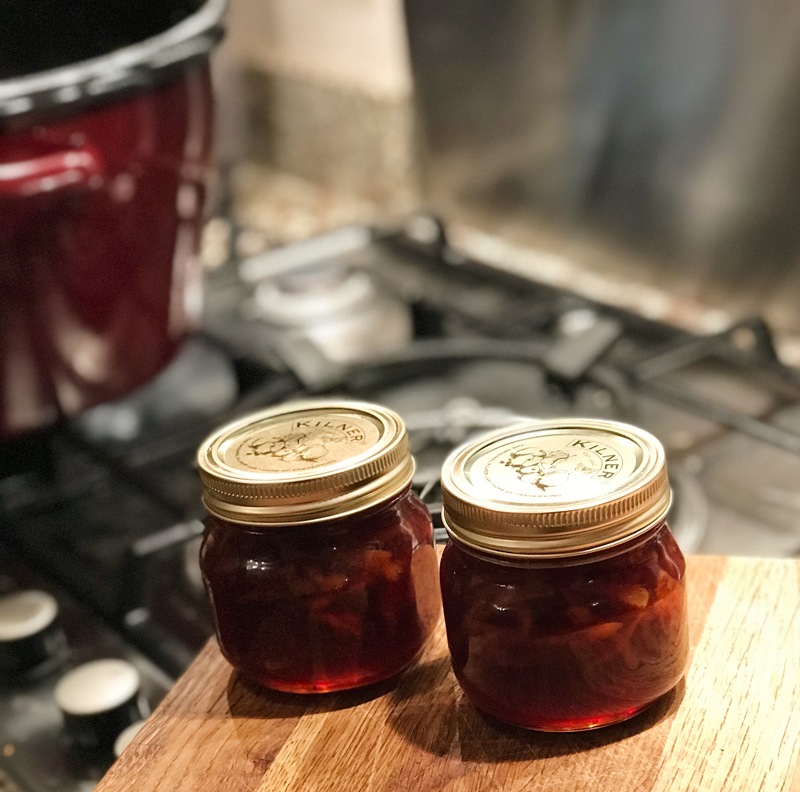 So after recipe reading, lots of opinions, tips & techniques, a mistake or two along the way, here goes – my marmalade tales: my how to/how not to guide of what I did, learnt and made. Timing & sourcing – the first important tip. 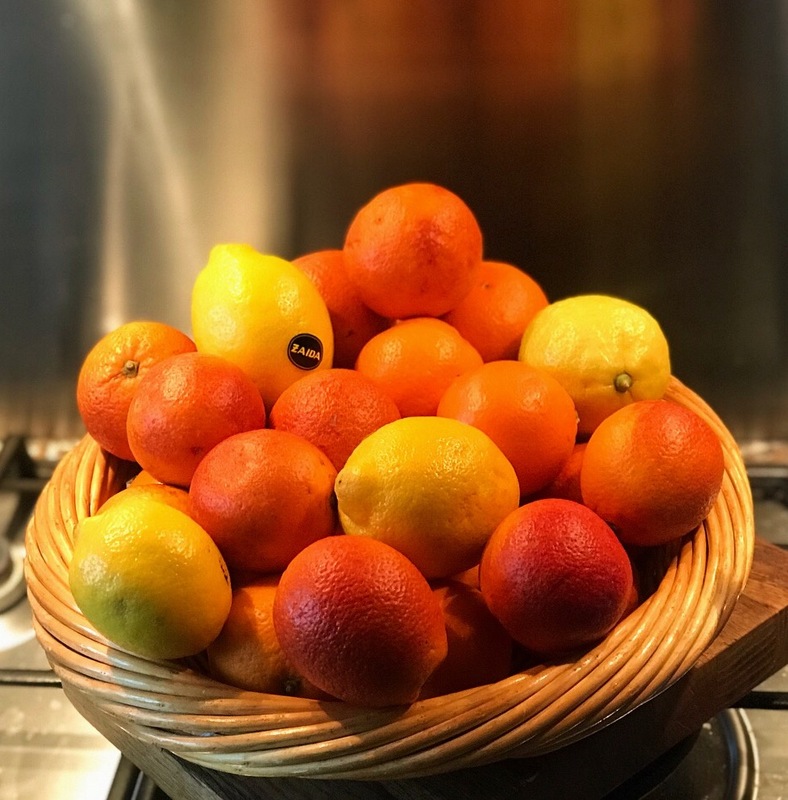 January is the Seville orange season, and my original plan was to make marmalade then. A few weeks delay meant a quest and hunt for the allusive key ingredient. My local green grocer said “you won’t find Seville oranges now in February you’re too late for this season”. Three shops later I had decided to make with Italian blood oranges only so bought a large quantity. Just one more shop, and to my surprise there they were- a few boxes of organic Seville-amazing! The Ave María farm (@avemariafarm) of Mairena del Alcoa, Seville, the growers – my marmalade saviours. To my delight at finding Seville oranges – lots more oranges purchased. Which leads to my next key learning- time. Sounds obvious but ensure you have enough time, especially as a first timer. 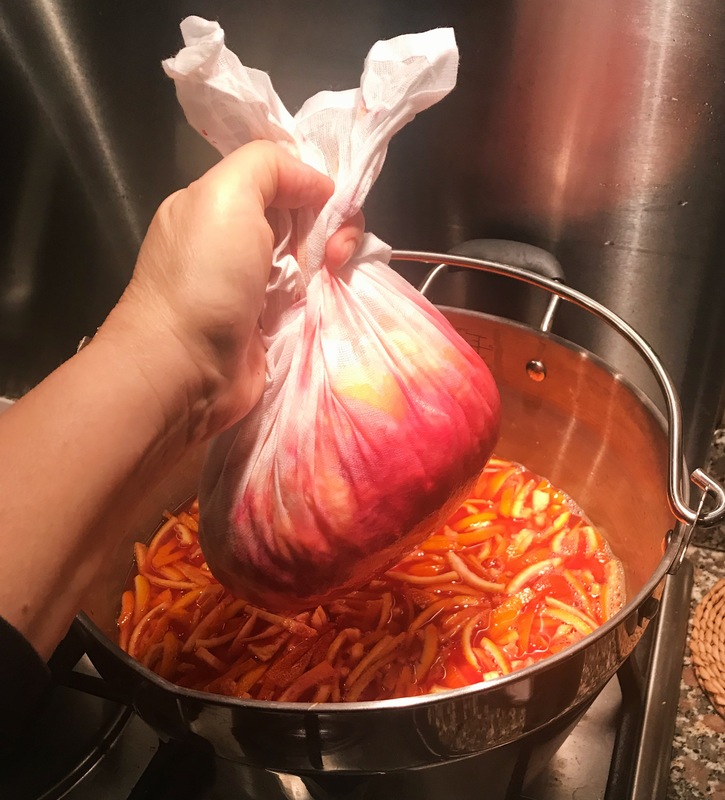 My first mistake- the more oranges, the longer it will take to prepare and make – simple. So marmalade ingredients found, knives sharpened, bowls, jam pan & stock pot at the ready. Lots of research – who knew there would be so many recipes, hints, tips, opinions on how to make marmalade. 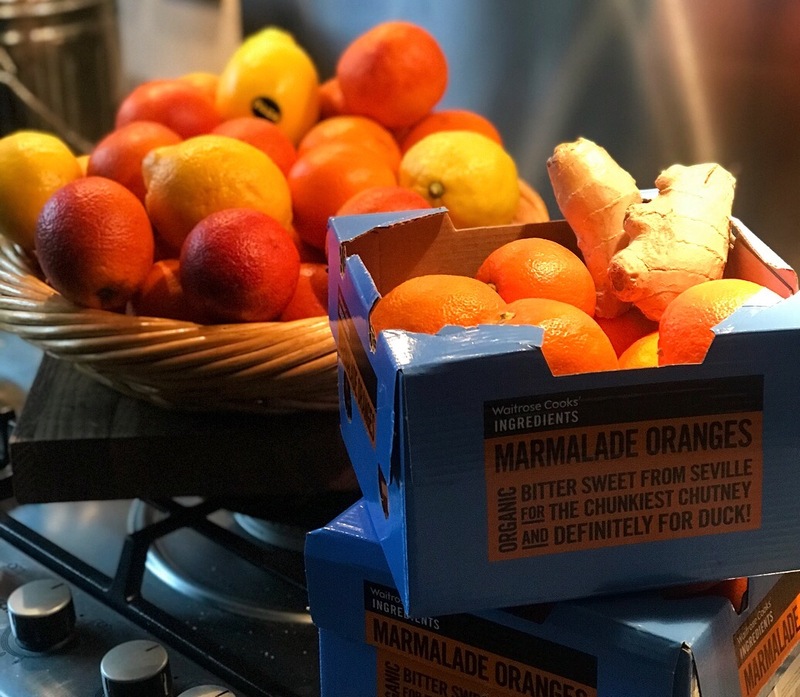 I found a recipe that said “foolproof, although it takes time, it is easy, just follow the steps and you are 100% guaranteed great marmalade”. I was “sold” so fruit washed and soaked in 2 big stock pots overnight. I am a fan of the Slow Food movement but 3,300 minutes, really? Blog banter the next day with Simon, who laughed telling me his Mum Rayner, a seasoned marmalade maker, never takes that long! So my second mistake re-reading the recipe was “where is the rind? “ I like my marmalade with “thick cut” peel and no mention of peeling, paring or cutting! So change of recipe and some great advice from the Yotam Ottolenghi Facebook group crew- Kate, Zahra, Lous especially- on line help from UK & Netherlands plus all the encouraging comments from further afield- global supportive foodie communities are fab! So oranges now on the boil with wonderful citrusy aromas wafting around the kitchen. 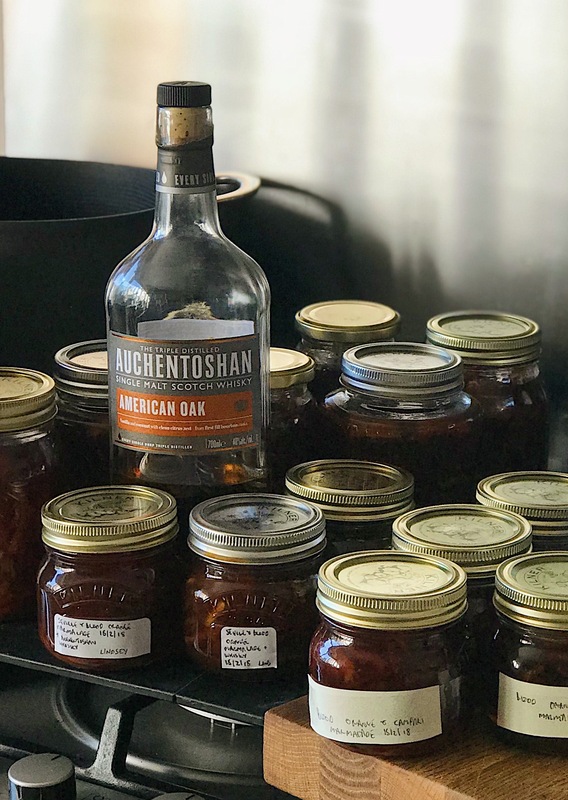 I made 17 jars of Seville & blood orange marmalade with muscovado sugar & Auchentoshan Scotch whisky, recipe below. Also 3 jars of blood orange, fresh ginger and Campari marmalade. I have scaled down the recipe to a more manageable number of oranges and included the things I learnt. Metal jam funnel (optional) or a steady hand! Wash the oranges, place in a large pan and cover with cold water about 2.25l/ 4 pints. Bring to the boil and simmer on a medium heat for about 1.5 hours until the fruit is soft, skin especially. Using a slotted spoon remove the oranges and place in a large heatproof bowl to cool. 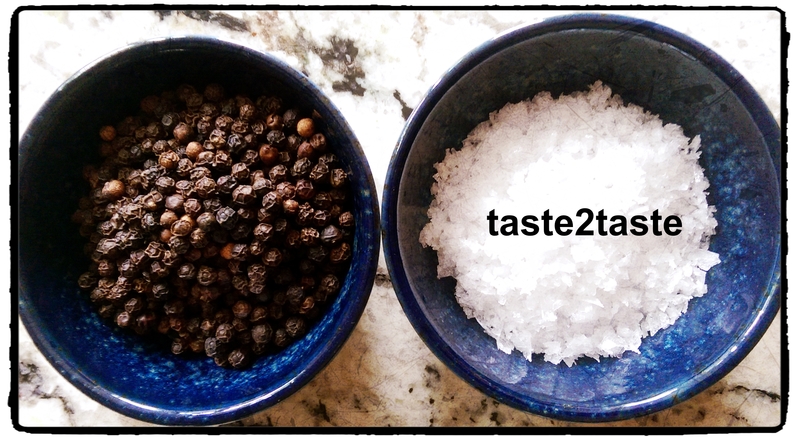 Once cool, halve, and scoop out the flesh, pips/seeds & white pith with a tablespoon. Place these in another bowl lined with the muslin square. These contain pectin, and are important as this will be key in obtaining a good set or gel like texture. Slice the soft peel/ rind into shreds with a sharp knife. I like a thick cut shred so cut mine into about 1/2 cm or 1/4 inch widths and 3 cm or 1 inch lengths. You can roughly chop using a food processor to save time but I prefer the look of hand cut shreds. Squeeze the juice of 2 lemons and add to the orange cooking water, about 1.4 l or 3 pints liquid. If less just top up with water. Remove the lemon pips and add to the orange pips, flesh & cooked pith in the muslin. Tie up the muslin tightly, use kitchen string if necessary and add to the pan of cooked orange juice/ water and lemon juice. Simmer on a low/medium heat for 45 minutes then remove from heat to cool. If you have time you can leave this in a cool place overnight otherwise leave for a minimum of 1 hour. Remove & squeeze out the muslin tightly back into the pan. 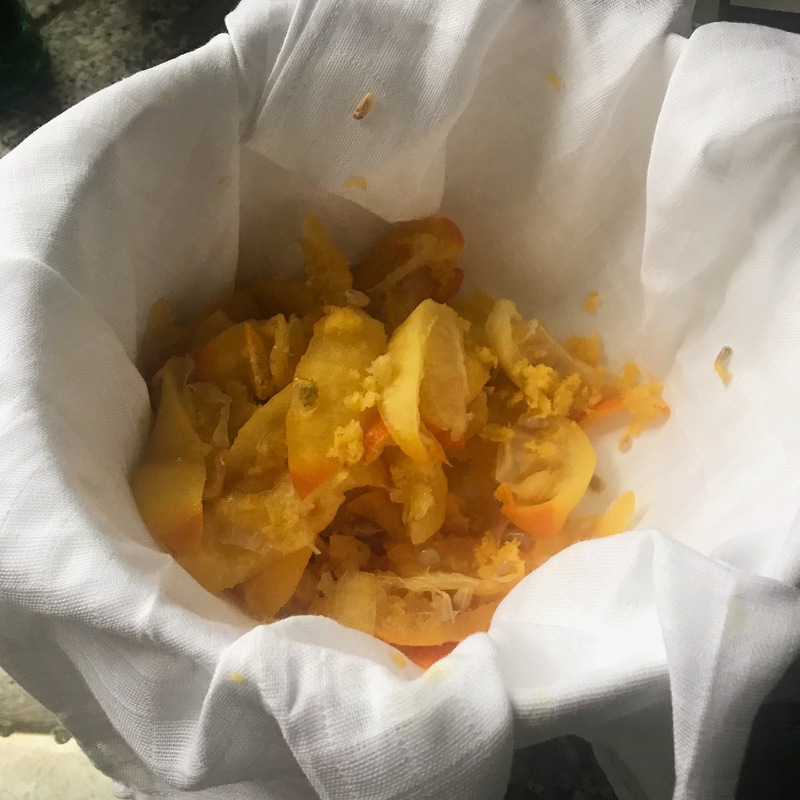 The juice will be slightly gel- like which is the pectin, the gelling agent naturally present in the oranges & lemon pips and pith. Discard the contents of the muslin- makes fragrant compost! You can wash and re use the muslin. 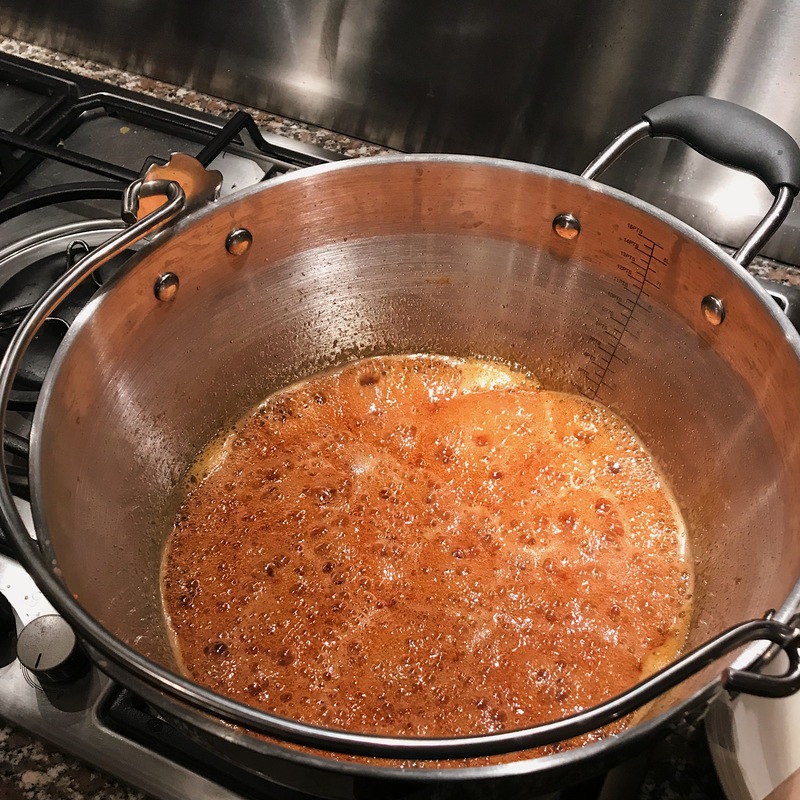 Heat the pan on a medium heat until the liquid is hot then add the granulated and muscovado sugar (if using). 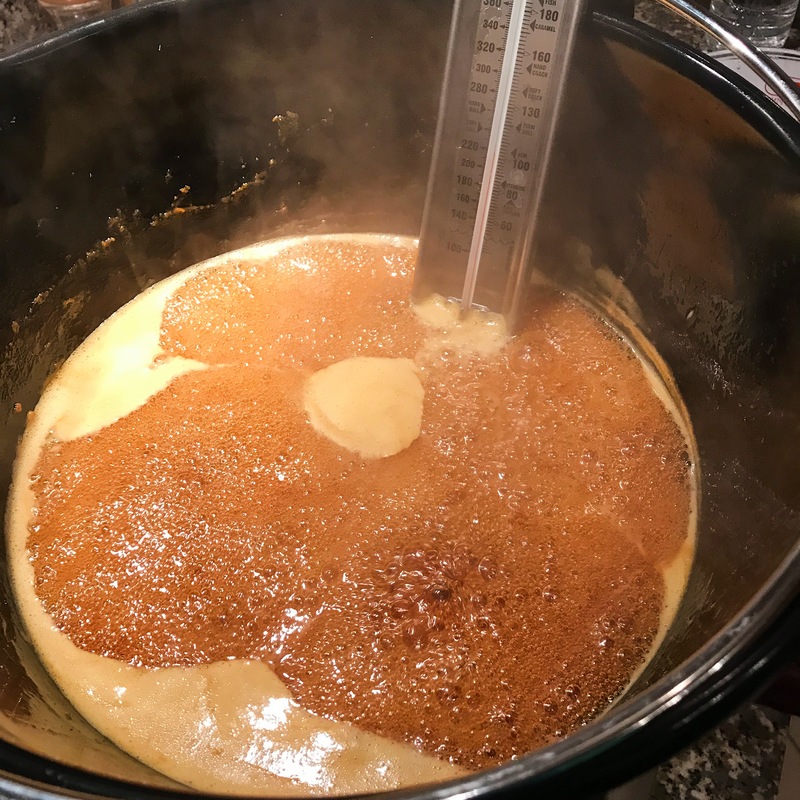 Allow to fully dissolve for about 10 -15 minutes without stirring, then turn up the heat to medium hot and bring to the boil. Keep boiling on a rolling boil ( see photo). You now want to keep boiling until you reach the set point. This should take around 20 -30 minutes but it will vary. Give the liquid an occasional stir to ensure it is not catching on the bottom of the pan. Meanwhile prepare the clean jam jars & lids for sterilising. I use Kilner glass jars with the 2 piece lids. I set my oven to 160C /320F fan, place the upright glass jars and outer rings on metal baking trays and heat for 10 minutes. For the inner lid with the rubber rim, follow the instructions as the rubber cannot withstand boiling water or temperatures above 82C/180F. If using a metal only lid these can be sterilised in the oven along with the glass jars. If you have a jam thermometer the marmalade set point is 104.5C/220F. If not see my photos, the mixture will be rapidly boiling, rising up the pan. To test the set point, place a saucer in the freezer for a few minutes. Using a metal spoon taking care as the mixture is extremely hot, place a few drops of marmalade onto the saucer and leave to cool for 2 minutes. If you push your finger through the marmalade and it wrinkles the set point has been reached. If not continue boiling and test again in 5 minutes and repeat if necessary until set point achieved. Remove the sterilised jars and lids from the oven. Once the set point has been reached, turn off the heat and leave the marmalade for 5-10 minutes. This ensures the peel is evenly distributed throughout as it cools and thickens. Carefully skim off any pale scum on the surface & discard. Then add the whisky if using and stir to mix in. Ensure all utensils are sterilised with boiling water and cooled on a metal tray lined with a clean cloth or paper towel. Once ready to fill use the jam funnel or metal spoon/ ladle to fill leaving the jars on the metal tray to catch any drips. Fill right up to the top to allow as little headspace as possible. Screw on the lids using heatproof gloves until tight. Leave the jars on the tray to cool overnight. Give the jars a final tighten, clean off any drips, label when the jars are cool and store in a dark cupboard.